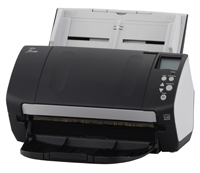 Fujitsu Document Scanner fi-7160 The fi-7160 and fi-7260 Scanner protect your documents with acoustic sensors, ensure your data is captured with smart ultrasonic technology, and reduce rescans by cleaning up documents automatically in a single pass. Reliability is enhanced even further with new skew prevention technology for exceptional paper handling. .
Fast, 60ppm / 120ipm scanning in color, grayscale and monochrome. 80-page Automatic Document Feeder (ADF). Embossed card scanning (1.4 mm thickness). Acoustic and Timing Paper Protection functionality. Comes with PaperStream IP (TWAIN/ISIS).